The scientist who led Britain's Beagle 2 mission to Mars has told BBC News he has multiple sclerosis (MS). Professor Colin Pillinger, from the Open University, said he had been diagnosed with a progressive form of the neurological condition in May. The planetary scientist underwent tests after having difficulty walking for the past two years. 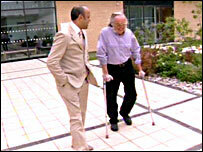 He now uses crutches when he is away from the security of his home or Milton Keynes laboratory. "I've found it increasingly difficult to walk," he said. "Some people have told me they were diagnosed and nothing else happened after that. For me, it has got worse. You just have to wait and see." Beagle 2, a robot designed to search for life, should have landed on Mars in 2003 but vanished without trace. The last anyone saw of it was in an image snapped from the Mars Express mothership as it hurled its baby towards the Red Planet. Since the disappointment, Professor Pillinger has been working to persuade space agencies to take a follow-up mission back to Mars. He told me his condition would not affect his efforts to get British technology back on the surface of the fourth planet. "The work is mostly about meetings and I can always reach you with a crutch if I need to prod you, you see!" 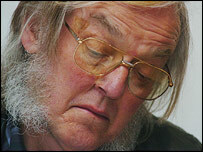 Professor Pillinger then gleefully demonstrated the various uses of his new "bargaining tool" on me. It graphically illustrated that he has lost neither his sense of fun nor fire. He submitted his latest plans to explore Mars to the European Space Agency in April, and has also asked the US space agency (Nasa) if it would be willing to put a Beagle "pod" on its Mars Science Laboratory probe in 2009. "We have unfinished business on Mars. The science is more important now than it ever was because of discoveries made with Mars Express, the Nasa rovers and ground-based astronomy. "It all suggests that we were right to look for life on Mars and we might be able to find both past and present life, and the experiments haven't been done yet. It's up to us to do them," he explained. Professor Pillinger is 62. It is highly unusual for someone his age to get the disease. It is more common for people to get the disease between the ages of 20 and 40. There is no effective treatment for the condition. So is he interested in diverting his efforts away from space and toward medical research? "I've thought as to whether or not I should suddenly become a champion for MS research. I think that would be a little bit selfish because I believe that by doing the things we do in space, we encourage people to take science and technology careers. "It's actually those people who'll be running the instruments in the hospitals that do the diagnostics. So I think I can do better championing all science rather than just one cause." The Open University scientist has stepped down as head of department in order to concentrate on his latest Mars venture. What happened to Beagle 2 as it headed to Mars? "The show must go on as regards looking for life on Mars," he said. "This is a question which has fascinated people for centuries. I think we're so close to finding out the answer. "I'd still very much like the team behind Beagle to be the one to answer that question. Unless you find whether there is or isn't life on Mars I don't think it's fair to start sending astronauts to explore the place." Professor Pillinger concedes that the MS will slow down his efforts to get back to Mars. "But," he says, "it's not going to stop me!"